Q. Can you provide biographical information about Pat Esch, a classmate of Sam Herman's in Harvey Littleton's course at Wisconsin in 1963? Image: Vase. Patricia Esch, artist. CMoG 2016.4.16. Gift of Elmerina and Paul Parkman. Patricia Esch was born in Madison, Wisconsin, in 1940. She attended Antioch College in Yellow Springs, Ohio, where she received a BA in Design in 1963. She then studied under Harvey Littleton at the University of Wisconsin until 1965. Afterwards, she moved to Colorado and set up a studio in Denver. According to one newspaper article from the time, Esch "is a glassblower. The only one within at least 800 miles of Denver. Maybe the only woman glassblower in the country" ("Glass Blower Sets Up Shop," newspaper title and article date unknown, Patricia Esch artist file, Rakow Research Library). Esch was a studio glassblower until 1974, when, she said, "I sold my equipment and returned to Madison, Wisconsin, where I have been a pastry chef. 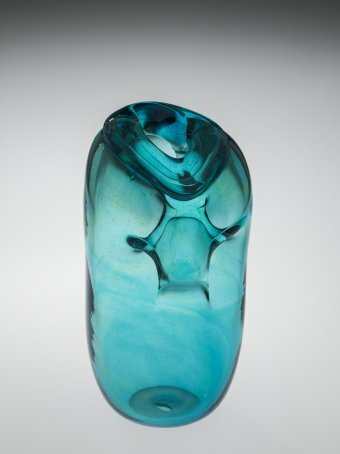 Most recently, I am making furniture as a hobby" (Lucartha Kohler, Women Working in Glass, 2003, pp. 42-43). Esch's art has been exhibited in the United States and internationally.